tags = in the email’s body or subject put “tags:” followed by the tags as you would normally add them to a flickr photo. limiting who can see your photos = in the prefix (just before the “@”) of your special flickr email, add “+friends” for friends only, add “+family” for family only, “+ff” for friends and family, and lastly, “+private” to make the images only visible to you. Of course, this isn’t specific to iPhone, so if you want to use this method to post your Flickr photos, it should work just fine. Audible.com. Sign-up for Audible Listener Gold and receive a free audiobook download. 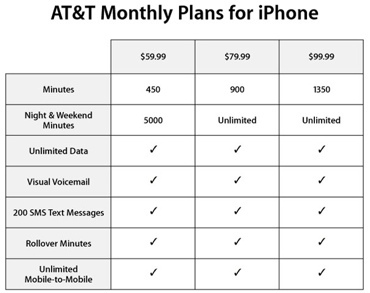 Apple and AT&T have announced the available rate plans for the new iPhone and they are simple and reasonably affordable. Prior to today’s announcement, many had speculated the iPhone may require an expensive data rate plan on top of the already pricey phone. You will require data plan, but the good news is it’s included with all of the required 2-year service contracts. Also included with every iPhone is access to the killer Visual Voicemail demoed by Steve Jobs at this years Macworld. With your new iPhone you will have a choice between 3 service plan options. $59.99 for 450 minutes, $79.99 for 900 minutes and $99.99 for 1,350 minutes. All plans include unlimited data (email and web), Visual Voicemail, 200 SMS text messages, roll over minutes and unlimited mobile-to-mobile and a one-time activation fee of $36. Family plans are also available. With the announcement of this pricing it looks like Apple is poised to make an even bigger impact when the iPhone goes on sale this Friday, June 29 at 6:00 p.m. (local time). You can pick up yours up only at Appleâ€™s US retail and online stores or from an AT&T retail stores in the US. The iPhone is available in your choice of the 4GB model or an 8GB model for $499 (US) or $599 (US) respectively. I have to say for me, prior to this announcement, I had no interest in getting an iPhone. Now I must admit it is looking a bit more attractive. Don’t get me wrong, I am still not getting one, but I believe this may push other “on-the-fencers” over to the buying side. Glad I’m not an Apple or At&T store employee scheduled to work this Friday. Good luck fellas! 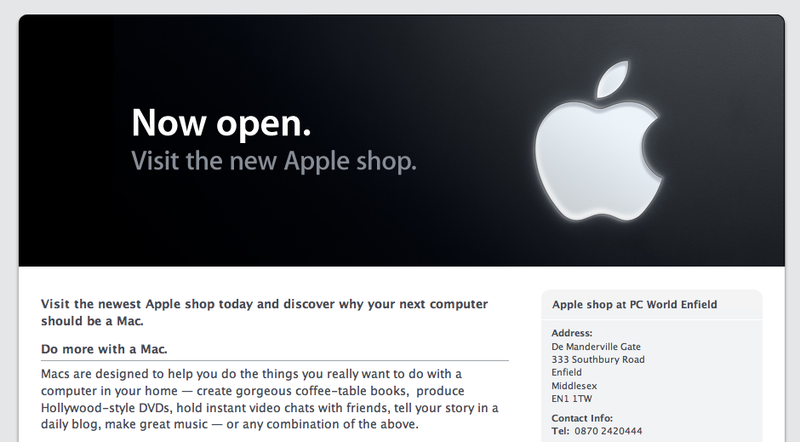 Apple’s website detailing a new shop they have opened within PC World at Enfield, Middlesex, UK. My previous experiences with buying Apple kit from a PC World has left a lot to be desired, so this news is very welcome. The page on the Apple website explains how the full range of desktops and laptops are on display, with regular demonstrations of the kit and related software. Good move, let us hope this helps to spread the word. Bing Gorden co-founder of Electronic Arts announced that they want to and are going to be in the Mac game(no pun intended). This is what I’m talking about and what some of you said in the comments section on my previous article. EA is answering the call by releasing at the same time in July Command and Conquer 3, Battlefield 2142, Need for Speed: Carbon, and Harry Potter and the Order of the Phoenix(believe it or not, but it looks pretty good). Bing also announced that they would also be releasing simultaneously their Madden and Tiger Woods games to the Mac. ID founder John Carmack also made an appearance to show off some new technology they are going to be implementing into their new games which will be shown off at E3, it would be a safe bet to say it will have an OSX release, only what is it, plus the fact that they are at the conference gets me all excited. So a huge announcement from EA saying they are going to give us Mac gamers what we want, and making it a timely release. Now we have to show them that we want this by supporting them, and purchasing the games. What do you think about these new developments? A full rundown of all the announcements from the WWDC 2007 keynote. MacBook Pro Updates. iPhone gets a birth-date. Movie rentals on iTunes? BootCamp 1.3 Beta released. Doh! Zune does AAC. Extract audio from Quicktime and put it on your iPod. Help with the System Preferences and other OS X crashes. A podcast about all things Macintosh. For Mac geeks, by Mac geeks. A brief special episode following the WWDC 2007 Keynote. A full new episode of the Maccast is on the way, but I wanted to get out a quick show summarizing what Steve Jobs talked about in the keynote this morning. Lots of good stuff in here including, games on the Mac, highlights on 10 out of the 300 new fetaures in Leopard, a BIG (Vista-sized actually) announcement for Safari, and news on developing iPhone apps. Fun stuff. Three new Apple iPhone ads were released over the weekend, and there’s a little more information they provide for all of us that can’t get enough iPhone in our diet. You can view the new ads on Apple’s website, or embedded below from YouTube.